Used Mazda RX-8 Review - 2003-2011 | What Car? 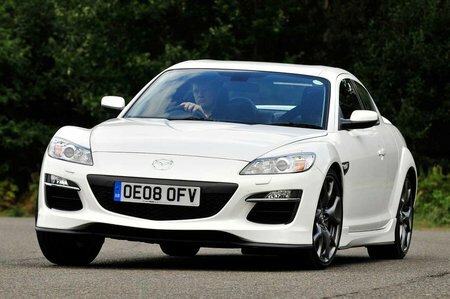 What's the used Mazda RX-8 coupe like? Sports cars this talented just don't come this cheap. Or at least, they didn't until the Mazda RX-8 came along. It's a bargain as a new car, and if you plump for a used example, it's even more of a steal. What sets the RX-8 apart from other coupes is its practicality. The wonderfully inventive design gives it four doors and four seats, the rearmost of which will carry adults in comfort. Not many four-seat coupes can say the same. There's even a decent sized boot. It's the drive that really impresses, however. Both versions give exhilarating performance, and the engines make a great noise. The handling is terrific, with seemingly endless grip and wonderfully direct steering. The ride is a touch firm at low speeds, but not offensively so, and it becomes impressively comfortable at high speeds. There's plenty of equipment on both versions, build quality is excellent and you can look forward to cast-iron reliability.